Nestled in the center of historic Saluda, Aiken and Edgefield Counties, and the charm of Augusta, Georgia, this sprawling 3400 sq foot home built at the turn of the century stands out as as one of the most beautifully designed in an area where grand historic homes and buildings remain popular and have stood the test of time. This hand-crafted spindled ginger bread, 9 gabled home boasts architectural details incorporating 4 specific Victorian and Queen Ann styles popular in the mid 1800's. The home to be one of a kind and remains today one of the most beautiful and unique hand-crafted historic homes. The house is all one level and the large rooms flow seamless from the grand hall that runs the central length of the house. Large suites all have private baths and sitting areas each boasting a different theme. There is a large living room, dining room, resting room, fully stocked modern kitchen, glassed-in sun porch (perfect for relaxing with a great novel) and a complete wrap porch encircling the house. Cable and Internet are provide. 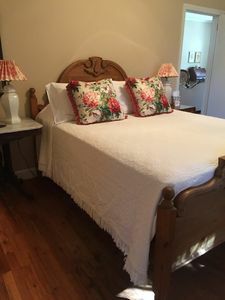 The house is surrounded by the most beautifully crafted gardens and sits on almost 4 acres that include a pecan canopy and large open meadow. The Gables is located in the middle of 4 historic counties that boasts the best shops for antiques, local craftsman and artisans, golf, the beautiful Lake Murray, Lake Greenwood and Strom Thurmond Lake, historic homes and buildings tours, bike trails, geo-cashing sites, agro-tourism with micro farming, micro breweries, wineries, an distilleries featuring The Palmetto Moonshine, clay shooting at the Wild Turkey Federation shooting complex and access to all things equestrian including horseback riding for beginners and experts and restaurants to please every pallet including the famous Juniper's Restaurant in Ridge Springs. A visit to The Gables offers something for everyone making it an all around great vacation and get a way and time of the year. Each of the surrounding towns have festivals and events throughout the year - whether it is the great Harvest Festival for Ridge Spring in October or the Peach Tree 23 - a 40 mile yard sale spanning the entire length of Highway 23, the Johnston Peach Festival. Magnolia on the Ridge Artisans weekend or the Wonderful Weekend in Ward and the Christmas Tour of Homes, From January to December there is always something to see. Calling all horse lovers - Bring your horses to board with our friends at Magnolia Ridge while staying with us at The Gables!
. Country Retreat centrally located in CSRA: Masters, Aiken and Edgefield.